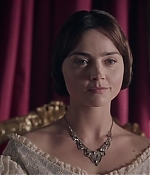 I’ve added screencaps of the amazing season finale of Victoria! Go watch it if you haven’t already, if you think this is the end of Victoria then you’re wrong! We will be getting a Christmas Episode and then Season 2 in 2017, I can’t wait! Jenna really deserves it. Enjoy viewing the screencaptures!